It begins with the design of the building itself. 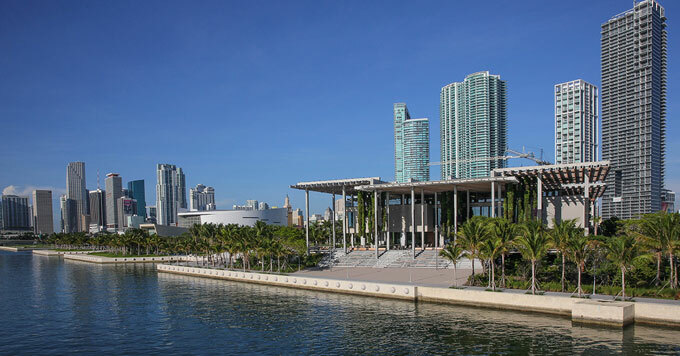 Photo: Courtesy of Pérez Art Museum Miami. That’s Mark Rosenblum, the Museum’s deputy director for finance and operations. To enter the waterfront museum, visitors climb a large staircase under hanging gardens and giant pergolas. The entry is so striking that most visitors do not notice the real reason for their uphill climb: the first level of the museum is elevated more than 20 feet to help keep the artwork safe from flooding. Rosenblum says the building was carefully designed to withstand the storms and rising seas that are expected to get worse as the climate changes. Heavy concrete walls and extra thick glass protect the building from strong winds. Below the elevated galleries is a parking area that drains quickly when flooded. Rosenblum says preparing for the effects of climate change will help the museum serve as a cultural and community hub for decades to come.